Here at GBW we put together The Big List of Companies That Blog. The goal of that post was to show just how many companies are using blogging as a business strategy. It was interesting, even to us, to see just how many companies are blogging. We’re talking about the top companies on the Fortune 500, the Inc. 500 and the Internet Retailer 500 lists. Since we were looking at those companies in compilation I thought it would make sense to continue our series of analyzing blogging strategies. Today, we look at one of the biggest companies in the world and how they are using blogging to improve their business even though some might consider them in an unsexy industry. I’ll admit I was surprised to see that John Deere had a blog. It shows just how little I know when it comes to most things. John Deere actually has quite of a bit of great content and I’m sure it does well for branding the company even more than they already are with their customers around the world. Here are a few insights from John Deere‘s Fleet Talk. The first thing you’ll notice is that John Deere has a video blog. That’s right. 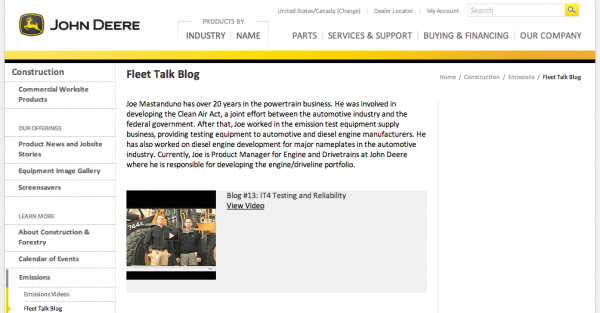 Fleet Talk is actually a video series instead of the traditional text-based blog. In today’s world of blogging there is a wide range of content types including text, video and audio. I consider all these the same even though others will try to segment them differently. The other points in this analysis will show why all forms of blogging is the same. With any blog the goal is to really focus on the frequently asked questions from a target customer base. This is one reason I feel that creating text, video and audio is all blogging. When you’re answering questions you’re blogging no matter what medium you do it with. In each of the Fleet Talk videos John Deere does a great job with addressing one or a couple of the common questions that its customers have. It seems simple, but this direction for a blog can lead to success. People are searching for specific information and if you answer their questions they’ll find your blog posts. That builds trust and loyalty with your brand, which both lead to more sales. For example, in a recent video, Deere talks about the issue of meeting emission requirements while maintaining reliability. That’s an important question their customers were having so Deere took the liberty of answering it with a Fleet Talk video. Simple concept, but it can really go a long way toward having a successful blog. It’s an old method, but a successful one. Apple has done it in the past and companies continue to use stories to sell their products. Basically, Deere is telling the story of how they manufactured their equipment. As you watch the video and listen you’ll appreciate all the work that went into creating the equipment. That builds an appreciation for how well put together the item is and gives the viewer more comfort in purchasing the item. Many blogs mix in customer testimonials and stories into their blog posts. Deere does this with their videos. Not only do they tell stories about the manufacturing process, but they mix in stories about how customers use the equipment. This is great because it’s not the company telling new viewers, but actual customers. Another reason this is great is because the customers use the language of other customers. The folks are Deere probably have their own terms for equipment and processes and many times those terms go over the head of the customers. When you let customers do the talking and describing they’ll use the language of other customers. That leads to more search traffic and social sharing. There are a couple of the great ways John Deere is using a blog to grow their business. Can you notice anything else?